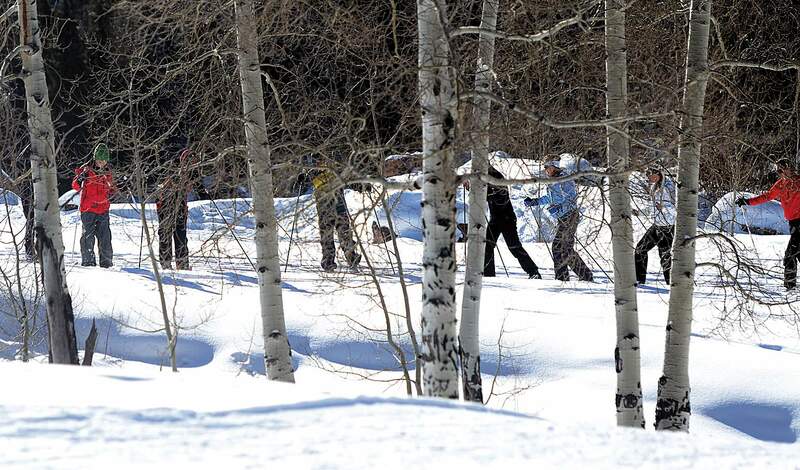 The Katz family on Wednesday purchased the Durango Nordic Center. The Katz family has come to the rescue of the Durango Nordic Center, purchasing nearly 200 acres of land near Purgatory Resort that includes the parcel recently slated for an ill-fated, massive RV resort. On Wednesday, Jane and Marc Katz announced they bought 190 acres in the Boyce Lake and Tacoma Village area across from Purgatory. “We look forward to working with members of the Purgatory community to preserve and improve the trail system on the property, help plan Phase Two of the Community Park and explore potential for other recreational and cultural uses,” Jane Katz said in a prepared statement. The Nordic center has been in operation since 1954, but the center has never actually owned the land where the trails are located. Instead, the center leased the land from Durango Mountain Land Co. The Nordic center also leases its building from the Purgatory Metro District. Last fall, plans were announced for a 157-lot RV resort on 54 acres across from Cascade Village, which would have wiped away nearly one-third of the center’s more than 14 miles of trails. The proposed RV park also drew fierce criticism from some members of the public who said the project’s size and density would compromise the mountainous and wooded landscape. However, it was announced last month the deal fell through after a contract dispute between the landowner, Durango Mountain Land Co., and would-be developers, Michigan-based Hearthside Luxury Motorcoach Resort. Gary Derck, CEO of Durango Mountain Land Co., said the Katzes now own all the land that has Nordic trails, and the family has “very exciting” ideas to expand recreational use. “They will still have entitlement for future development if they ever choose to add some Nordic ski-in/ski-out residential amongst the trails,” Derck said. “But they can take time and decide the best way to maximize the recreational potential of the land. “This kind of recreational vision, and the potential for even more entertainment and amenities in the future, will create tremendous value for Purgatory Resort, the existing residents of the Durango Mountain Resort community and our future development parcels, which we will continue to develop as the resort area’s master developer,” Derck said. The announcement calls attention to the fact the Nordic center is the only all-inclusive maintained Nordic ski area in La Plata and San Juan counties that offers groomed trails, equipment rentals, lessons and a lodge with facilities. The Nordic center is also home to the nonprofit Durango Nordic Ski Club, a competitive program for young athletes. Over the years, the center has hosted many national competitions. This is not the first time the Katz family has bought land in and around Durango for the purpose of giving back to the community. Marc Katz, co-founder of Mercury Payment Systems, now Vantiv, bought 1,850 acres on Ewing Mesa, adjacent to Horse Gulch, to turn into an outdoor music venue and public recreation area. That property, too, was slated for a proposed housing development before Katz stepped in. Ideas for the development of Ewing Mesa are in the planning stages. Katz, who has lived in Durango for more than 25 years, founded Mercury with his brother, Jeff, in 2001 in New York, moving the company to Durango a year later. In 2014, Mercury was sold to a larger competitor, Vantiv, for $1.65 billion, which remains one of Durango’s largest employers.